Travis Greene trains at the fifth Paralympic Military Sports Camp. For Scott Winkler, nothing could have been more important than completing a lifetime of service for his country. An Army service technician who entered the military a few years after high school, Winkler, 34, took a two-year hiatus in the late '90s, only to realize he belonged in the military. But in 2003, Winkler fell off an ammo truck in Tikrit, injuring his spinal cord. The former high school sprinter underwent years of physical therapy and rehabilitation before he discovered, six months ago, that he could not only throw the shot put and discus, but he could throw them well. And at the 2008 Beijing Paralympics, two weeks after the Olympics, Winkler could have a chance to serve the U.S. in a different way  by proving he is the best in the world. "Everybody has hidden talents somewhere along the line," he says. "I never, ever threw shot put or discus. I thought fishing was my only thing." 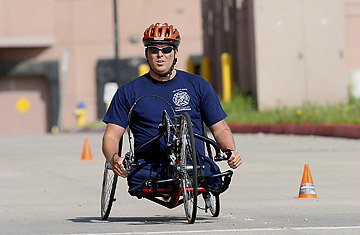 Winkler was one of 29 participants to attend the fifth Paralympic Military Sports Camp, held at the Olympic Training Center in Colorado Springs from May 3-8. The camp, launched by disabled Gulf War veteran John Register in 2005, is designed to help veterans like Winkler develop and hone new athletic skills through a series of intensive clinics. "We have 24 sports on the menu that can be offered," Register says. "On the battlefield, you strive for excellence, and there are a few here that continue to do that." U.S. Paralympics national team coaches and athletes train the veterans for events like archery, sailing and volleyball, and organize competitions for participants at the end of the program, which is funded by the United States Olympic Committee. Register, once part of the Army's World Class Athlete Program, didn't lose his leg during the war, but in a 1994 freak hurdling accident. During his rehabilitation and physical therapy, he began swimming, and by 1996 had landed a spot on the U.S. Paralympics swim team. As the 2000 Sydney Games approached, Register was running again, ready to tackle the long jump  an event for which he was an All-American at the University of Arkansas. In Sydney, he won the silver medal. "At that point, my life kind of came full circle," he says. Register's experience, combined with a commitment to rehabilitating veterans, gave him the idea to develop a program that would encompass servicemen and women injured during all wars. "We recognize that not everyone wants to be or will be a Paralympic athlete," he says. "But we can make the odds better." For some veterans, the transition to becoming a world-class athlete is fast. Take, for example, Travis Greene, 25. Greene's legs once carried him to a sprinting record in high school and a track and field scholarship to Boise State University. But in December 2005, three months into his third rotation in Iraq, the Marine Corporal lost both his legs above the knee to an IED explosion while trying to rescue other Marines. He spent more than a year in different rehab facilities, slowly learning to swim and play wheelchair basketball. Then, a few months ago, he heard about Register's camp. He thought this could be his opportunity to fulfill a new dream: making the Paralympics team for wheelchair racing. After just one week of training for the event at the camp, Greene is so fit that he expects his times will be strong enough to land him a spot on the 2008 U.S. team. "I have a lot of confidence I'll be able to make the team," he says. "With some hard work  and luck." Winkler also hopes to be a shoo-in for the shot put and discus at the Beijing trials in 2008. He has been to the Colorado camp twice, this past session to help motivate newly injured servicemen and women. "My thought process is, someone helped me at one time, so if you can just help one person, you've accomplished a lot." And he has. Already a champion at several regional competitions, Winkler has set his sights high for Beijing: "I want to be going for the world record, or just win a gold." Because it typically takes about three years to adequately rehab and train for the Paralympics, Winkler and Greene could be two of only a handful of other veterans from the Iraq and Afghanistan wars to make the 2008 team. But by 2012, Register says he's confident that veterans from those wars will make up at least 15% of the U.S. team. Although most of Winkler's time will now be consumed by rigorous training in Tampa, Fla., he will continue to encourage injured veterans to find new activities to try. Without his passion for training, he says he doesn't know where he'd be today. "I never dreamed I would have opportunities to do this," he says. "But for me, it gives me one more chance to do something for our country and do the best that I can do."